In 1886 the 19-year-old rookie set a major-league record with 513 strikeouts, a record that has stood for a century and a quarter and will probably never be equaled. His next season was one of the most dominant ever pitched in the history of baseball. As an amateur he was known as the Boy Wonder; as a professional he was called the Phenomenal Kid. Yet few casual fans today recognize the name Matt Kilroy. Matthew Aloysius Kilroy was born in Philadelphia on June 21, 1866, the seventh of the 13 children of Mary Ann and Partrick Kilroy. Patrick was born in Ireland in 1835 and immigrated to the United States in 1850, shortly after the devastation of the potato famine. He married Mary Ann, the daughter of Irish immigrants, and the couple lived out their lives in the City of Brotherly Love. Patrick worked sometimes as a coal trimmer and sometimes as a car driver.1 Mary Ann stayed home to care for her large brood. Kilroy made his professional debut at the age of 18, winning 29 games for the Augusta Browns of the Southern League. He advanced to the big leagues the very next year as manager Billy Barnie signed him to a Baltimore Orioles contract. At the age of 19 Kilroy made his major-league debut on April 17, 1886. The youngster stood 5-feet-9-inches and weighed 175 pounds. He pitched and batted left-handed. Despite the fact that the Orioles were a weak team that year, finishing in the American Association cellar, Kilroy won 29 games his rookie season. But he led the league with 34 losses. The 1969 edition of the Baseball Encyclopedia credited Kilroy with three no-hitters during his rookie season—April 26 against the Philadelphia Athletics, on August 20 against the same club, and on October 6 versus Pittsburgh.4 Although the no-hitter against the Alleghenys is well documented, no recent reference book lists any hitless performance by Kilroy against Philadelphia. 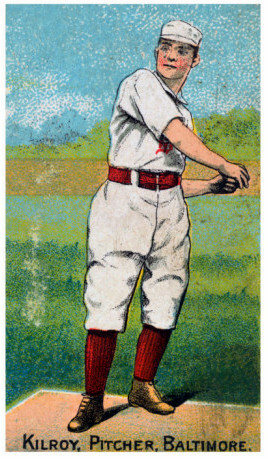 In addition to the no-hitter, Kilroy hurled three one-hitters and four two-hitters during his first year in the majors. If a batter was lucky enough (or skillful enough) to reach base against Kilroy, he had to be wary against being picked off. The young lefty was reputed to have one of the best pickoff moves in the game. He would make the same step forward as though he was going to pitch, but would throw the ball underhanded to first base, instead of delivering it to the plate. This maneuver would be illegal today. At the present time, once a pitcher moves toward the plate he must follow through with the pitch or he will be charged with a balk. Nevertheless, the stratagem proved very effective for Kilroy in the 19th century. In 1887 the American Association instituted a rule requiring four strikes for a strikeout, and the number of strikeouts declined dramatically, but Kilroy’s effectiveness increased. He led the league with 46 wins and 66 complete games. He also topped the circuit in shutouts and finished second in strikeouts, third in won-lost percentage, and fourth in WHIP (walks and hits allowed per nine innings pitched). Most remarkable was his 46-19 record with a club that was 31-37 in games in which Kilroy was not the pitcher of record. This performance earned him the highest weighted rating (16,900) and the most Faber System points (138) ever attained by a pitcher of his tender years.5 His 46 wins is still the single-season record for a left-handed pitcher. The 75 wins he accumulated in his first two major-league seasons remain a record to this day. Late in the 1887 season Kilroy suffered a sore shoulder as the result of a collision with third baseman Arlie Latham of the St. Louis Browns. According to researcher John J. O’Malley, the injury was responsible for a sore arm that shelved Kilroy during parts of the 1888 season, causing his victory total to fall below 20 for the first time.6 On April 9, 1888, the 21-year-old Kilroy married Frances “Fannie” Denny, the 20-year-old daughter of Irish immigrants. The newlyweds spent their honeymoon at the Orioles’ spring-training site, then settled into a home on Lehigh Avenue in Philadelphia, the same street on which Matt had lived as a child and where he lived almost all of his adult life. Matt and his younger brother Mike were teammates briefly in 1888. Mike, a right-handed pitcher, had a long minor-league career but never won a game in the majors. Fannie died on December 15, 1923, at the age of 56. In 1930 the widowed Matt was living on Lehigh Avenue with his son Thomas, The census identified Matt as a restaurant manager and Thomas as the assistant manager. A lifelong resident of the same Philadelphia neighborhood, Kilroy died in his hometown on March 2, 1940, at the age of 73. He is buried in the Holy Sepulcher Cemetery on Cheltenham Avenue, in Montgomery County, just outside the Philadelphia city limits. He shares a gravestone with Fannie, daughters Ethel and Florence, both of whom had died young, and his son Thomas, who passed away in 1964. Matthew Kilroy’s ten-line obituary in the New York Times provided no details about his death, nor did it identify his survivors. The brief piece concluded by simply stating. “Kilroy was regarded as one of the leading pitchers of his day.”9 Yes, he was. Baseball Encyclopedia. (New York: Macmillan, 1969). Charles F. Faber, Baseball Ratings. (Jefferson, North Carolina: McFarland, 2008). Pete Palmer and Gary Gillette, The Baseball Encyclopedia (New York: Barnes and Noble, 2004). Robert L. Tiemann and Mark Rucker, eds. Nineteenth Century Stars (Kansas City, Missouri: Society for American Baseball Research, 1989). 1 In 1870 a coal trimmer worked at loading coal into ships, including such tasks as using a shovel to spread the coal evenly in the hold of the ship. It is not known what kind of a car Patrick drove in 1880. He may have been the operator of a streetcar or perhaps the driver of a hansom cab. 2 Boston Globe, October 11, 1890.